Albariño Wine Festival, Cambados - Pontevedra - Spain. 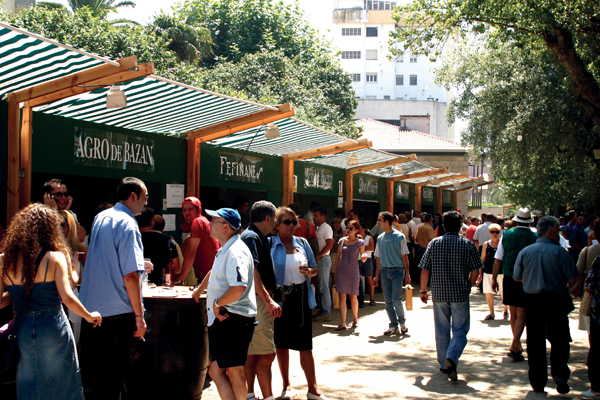 Cooking is one of Galicia’s main tourist resources: the quality and variety of its local products are the foundation for the diversity of dishes that are prepared, and products served. These products, from the country, from livestock and, above all, from the sea, have their own peculiarities, and although nowadays they can be found outside Galicia, local quality is still the main feature of Gallego cooking. What is more, it should not be forgotten that one of the most prestigious elements of our cuisine has been the professionalism of our chefs, who work not only in Galicia, but can be found anywhere around the world. Exaltations of cooking arouse the interest of whoever visits them. The origin of these fiestas is in local or district celebrations to commemorate the place’s traditions, friends’ meetings, or harvest or religious festivals, such as the pilgrimages, when fulfilling the promise to the Saint was completed with a traditional meal. On gaining renown, the fiesta attracted people from other places. Other exaltations of cooking sprang up with the tourist industry already in mind. In total, they number around 300 all over Galicia every year: on the coast, fish and shellfish are the most common; inland, the basis is meat and freshwater fish.